Coinciding with a national march against police violence in Washington, DC, organizers have planned a march here in San Diego on the same day. 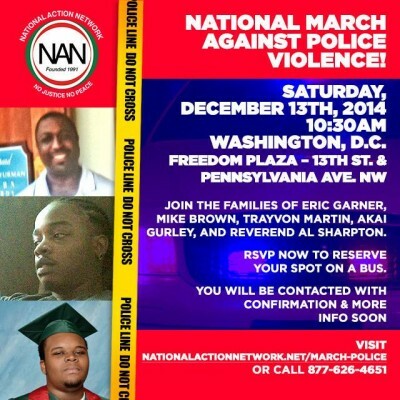 The national march is being organized by the National Action Network in response to the recent shootings by police of unarmed Black men and the failure of grand juries to indict the cops involved. Protest have erupted across the country on a daily basis since the most recent failure to indict last week by a New York grand jury. The solidarity action in San Diego is on Saturday, December 13th, and begins at the Balboa Park Big Fountain at 10:30 am. Speakers are planned, as well as a “Die-In” and a march. At 10:30 – Meet at the big fountain. A National march against police violence has been called for and we will answer that call in San Diego. Please share this information and gather allies and activists to unite with the world as one. Will stand up to bullying. We will stand in solidarity.